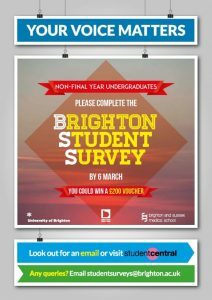 Unless you have been avoiding emails, not coming into university and not talking to anyone in the School you will, no doubt, be aware that the all undergraduate students are being asked to give their feedback on their university experience to date via either the Brighton Student Survey or the National Student Survey. This feedback is extremely important to both the school and university and helps us make changes for you. The BSS is the School and University’s main opportunity to gather feedback from all level 4 and 5 students so that we can understand what we are doing well and what we can improve. The BSS is opened on Monday 6 February and will close at midnight on Monday 6 March, if you haven’t yet, please do take 10 minutes to complete the survey – there are only a few days left and every response matters. Completing the survey automatically enters you into a prize draw with the opportunity to win a £200 voucher from the university. The National Student Survey (NSS) is commissioned by the Higher Education Funding Council for England (HEFCE) and is a national survey, undertaken by Ipsos MORI, which gathers the views of all final year undergraduates about what it has been like to study their course at their institution. The survey comprises 27 questions in the survey cover teaching, assessment and feedback, learning opportunities, academic support, organisation and management, learning resources, personal development, and the student voice. There are also questions about careers, course delivery, work placements, welfare resources and facilities, social opportunities and overall satisfaction. Because the school would really like to receive feedback from as many students as possible we have decided to donate £100 to the student society associated with the course that has the highest proportion of their students completing both the BSS and NSS so your society could receive up to £200 for 10 minutes of your time.